Schulties Road is closed to cars. Tucked away in the Santa Cruz Mountains, the “town” of Laurel isn’t a destination, rather it is a memory of what used to be, the living quarters for workers at a thriving sawmill and a train stop for the South Pacific Coast Railroad. I like to ride by here once a year to check out the tunnel entrance and enjoy quiet solitude in the redwoods, but today’s ride hearkened back to Jobst Rides of old — those adventures following the brutal winter of 1982-83, memorialized in Once Upon a Ride. They weren’t, but I knew that no road closure was too great to overcome on a bike. 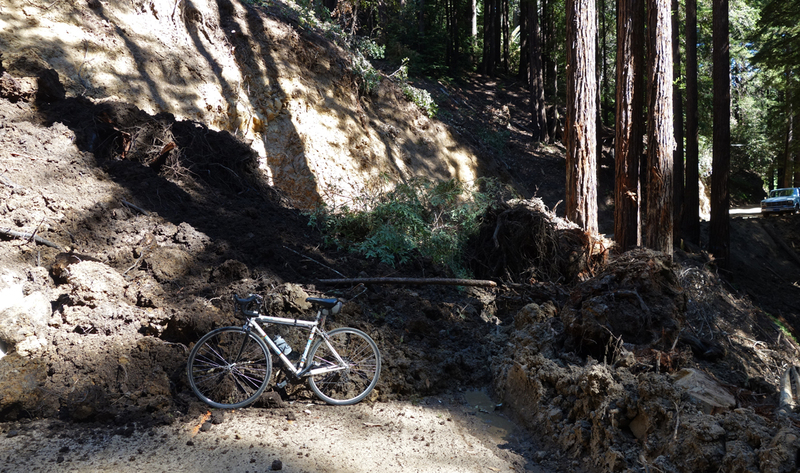 I expected to see a barricade around every corner but I kept descending into the bowels of the redwoods, bottoming out at Burns Creek. It was here that I saw the last barricade warning of road closure ahead. I had just passed another slide that was fixed and in 1982-83 there was yet another slide on the steep descent to Burns Creek. Not more than a tenth of a mile later I saw the closure, a big blob of mud occupied the road. Since it has been there for weeks, the local residents who live just up the hill installed wooden stairs, which made the clambering so much easier. 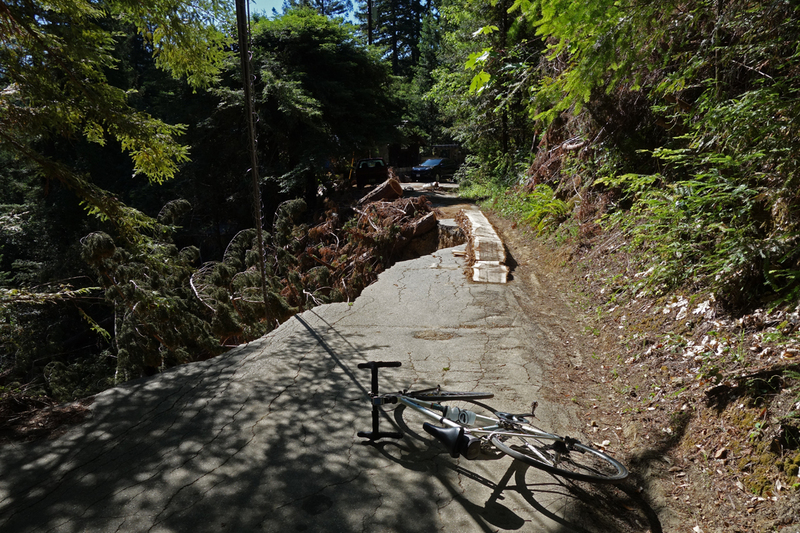 First, I eased the bike down a steep slope onto the old road. Once past that slide I saw another warning on Schulties Road. I wasn’t a bit surprised as this remote track lost its pavement decades ago and is little used except by a handful of local residents. I continued on and at the last house saw the first slide. It’s a doozey with a steep drop-off into the gulch that feeds Burns Creek and close to another tunnel entrance crossing the creek. I carefully walked over the downed wires and across the log bridge (no riding here) and then onward, wondering what other road closures lay ahead. In less than a mile I came to another blob, this one so big that there was no way around. I had to go over. I gingerly put my foot down and in it sank, but not enough to swallow my shoe. I managed to walk through the slide and on the other side cursed my brakes with their narrow clearance. Mud caked what little space there is between pad and rim. If not for those two obstacles, Schulties is in fine shape, dry and always pleasant without traffic in the dense redwoods. From what I could tell, Santa Cruz County will fix the road, in due time. This Schulties slide is still sticky mud. Expect to get muddy. This entry was posted on May 21, 2017 at 4:36 pm and is filed under Ride reports. You can follow any responses to this entry through the RSS 2.0 feed. You can leave a response, or trackback from your own site.